There’s Somebody Missing – Your Customer!! Home / Ask Listen Retain / There’s Somebody Missing – Your Customer!! We don’t want to alarm you, but if your company is like most businesses, there’s somebody missing whenever you and other managers get together to make plans, or to discuss day-to-day operations. And that somebody is very, very important indeed, because that somebody is your customer. Now we’re not saying that you don’t have customers – nobody’s suggesting that they aren’t out there on the floor or checking into your web site, looking at merchandise and placing orders. But are they there when you make the important decisions – the ones that affect the way that they feel about your store, and that determine your bottom line? Is there anyone in your organization who speaks for the customer? Is there anyone who can speak for the customer – who knows enough about how customers think, about what they want and how they feel, to tell you what you need to know? Because you do need to know what’s on your customers’ minds, how they react to your business, and what the experience of dealing with your business is like for them. If you don’t know those things, you might as well wear a blindfold – and require all of your clerks, all of your store managers, and all of your district managers to do the same. Customer retention strategies should be at least as important a part of your business plan as anything that affects the bottom line – because your customers are the bottom line. how to get the answers that you need, and you can work with Compechek to tailor each customer satisfaction questionnaire so that it asks the questions which you need answered. 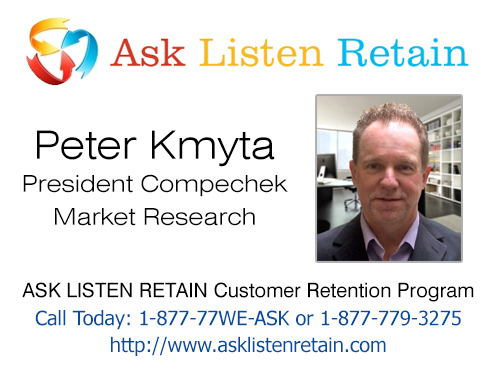 And the ASK-LISTEN-RETAIN system will analyze those answers to give you a clear, honest picture of how your customers feel about your business, and about the specific items that concern you, such as service on the floor, special promotions, or special orders. The ALR system does put the customer’s voice right in your boardroom – and, with its built-in notification and accountability, in your store managers’ offices as well. So don’t let the missing customer get in the way of your business plans. Take a look at Compechek and ALR, and see what they can do for you.